Whether you’re a professional sewer who sells your hand-stitched creations or you enjoy sewing your own one-of-a-kind apparel, accessories, or home décor, there’s no doubt that you are familiar with the many different types of fabric. The type of fabric you choose to work with really depends on the items that you are creating. For instance, if you want to make a warm and comfortable shirt, flannel fabric is the perfect choice; or, if you are interested in making a plush, cozy blanket, fleece might be your go-to material. There’s another fabric that every seamstress should have in her sewing room, too: jacquard. It’s one of the most popular types of sewing fabric around. That’s because it’s sturdy, yet soft, it comes in an array of styles, and it can be used for virtually anything. In fact, due to its versatility and features, if you’re looking for jacquard fabric, you’ll find that there are literally endless options to choose from. 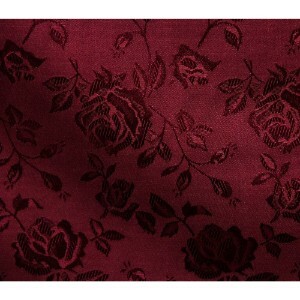 But, as with any other type of material, you want to make sure that you are choosing the best jacquard material. When there are so many options to choose from, how can you tell which one to choose? To help you on your quest for finding the best jacquard fabric, we’ve put in the leg work for you. After assessing dozens of jacquard materials and reading through countless reviews, we’ve narrowed down the field to five options that we consider to be the very best out there. Now that you’ve had a look at our picks for the top five jacquard materials, let’s take a closer look at each one. Below, you’ll find a detailed overview of each of the above fabrics, including key features, what we like about each one, and what other users who have worked with them have had to say. After you finish reading through the reviews and you’re ready to make a purchase, click on the yellow link to find the best prices currently available on Amazon. First up on our list of the best jacquard fabrics is this option from Fabric Empire. Made of 100 percent polyester, this material is extremely sturdy, yet soft, easy to work with, and easy to care for; it can be machine washed and tumbled dry, which is something you can’t do with a lot of jacquard fabrics. 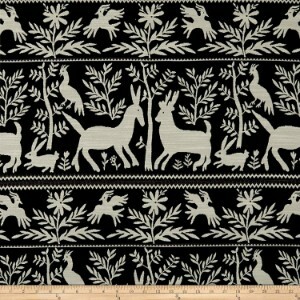 This material is 58 inches wide and it’s sold by the yard and cut to order in one continuous piece; so, if you would like 4 yards of material, you’ll receive length of jacquard that measures 4 yards long. We really like that it’s a continuous piece of fabric, as it really does make it easier to work with. 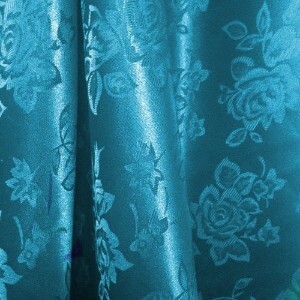 This fabric features a lovely embossed rose print, which would be well-suited for a variety of projects; it could be used as drapery or you could use a dress form to turn it into a stunning gown, for example. It’s also available in a variety of colors, including burgundy, aqua, orange, black, pink, purple, coral, red, silver, fuchsia, gray, turquoise, light blue, violet, lilac, white, mint, and yellow. With so many colors, you’ll definitely be able to find an option that will suit your needs. Based on the reviews that we read, all users who purchased this jacquard were very happy. They stated that it was beautifully designed, has a lovely texture, is easy to sew, and washes well. Final Verdict: If you’re looking for a truly versatile, durable, and easy to work with jacquard material that is affordably priced, you’ll love Fabric Empire Jacquard Fabric. It’s very well made, features a lovely design, sews beautifully, and comes in so many different colors! Next up is a collection of Eroica Jacquard Fabric materials. 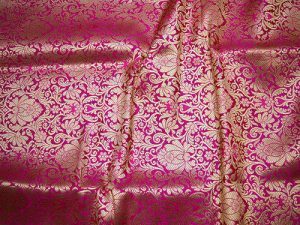 You’ll find that there are several different patterns of jacquard to choose from, including floral, paisley, and hollyhock damask, just to name a few! With so many choices, whether you are looking for a traditional jacquard or you are on the hunt for something really unique, you can rest assured Eroica has something to offer. All of Erocia’s jacquard materials are sold by the yard and cut to order, so you’ll be able to get the exact amount that you need. Additionally, most of their materials measure 56 inches wide and all are 100 percent polyester. Each material is very sturdy, easy to work with, and can be machine washed and tumbled dry for super simple care. In addition to the variety of patterns, there are also several different color options available, such as cocoa, black, red, burgundy, lapis, mist, platinum, and even cappuccino! The durability of all of Eroica’s jacquards makes it great to use an upholstery fabric; with the right sewing tools, you can transform an outdated sofa into an eye-catching piece of furniture, for example. Or you could pair it with fleece to make a posh and plush blanket, or match it with velvet and sewing beaded trim to create a stunning dress. The options really are endless! According to the reviews that we read, the majority of customers who used this material stated that they were very pleased. It’s affordably priced, sturdy, easy to work with, and there are so many different designs and colors to choose from! Final Verdict: Whether you’re looking for a traditional jacquard pattern or something that is truly unique, you’ll find something that suits your needs perfect with Eroica Jacquard Fabric. Every option this manufacturer offers truly is incredible. 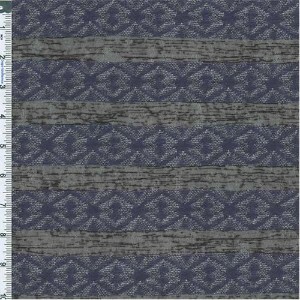 Another fantastic jacquard fabric option is by Fashion Fabric Club. This manufacturer offers a wide selection of highly durable, very well made, and quite unique jacquard materials; they also offer a nice selection of traditional jacquard prints, too. Like the other materials listed in this review, everything from Fashion Fabrics Club is sold by the yard and cut to order, which means that you can get the exact amount that you need. The width of their fabrics do vary, depending on the material that you purchase; for example, some are 58 inches wide while others are 50 inches wide. Additionally, the construction differs from material to material; some are 100 percent polyester, while others are made with a blend of polyester and lycra or polyester and cotton, and so forth. The fibers in each material are clearly listed in the description. Because the construction differs, care varies from material to material; some may be machine washable, while hand washing or dry cleaning might be better suited for others. However, all of the jacquard fabrics offered by Fashion Fabrics Club are very easy to work with, as most of the users who shared reviews pointed out. There are tons of different color options and patterns to choose from, so you will certainly have no trouble finding something that will work for your needs. Our personal favorite is their Chevron Chenille Jacquard, which is made of cotton and rayon and offers the softness of chenille. The pattern is printed in beige, turquoise, blue and brown to create a stunning and truly unique look. Final Verdict: For a lovely selection of high-quality, affordably priced, and truly stunning jacquard fabric that’s sold by the yard and cut to order, Fashion Fabrics Club jacquard is a fantastic option. If you’re looking for a nice selection of traditional jacquard fabric in a satin finish, then The Fabric Exchange will surely have a material that you seek. This manufacturer is known for creating some of the most stunning materials, and their jacquard is certainly no exception. The majority of the materials that this manufacturer offers features a traditional floral pattern, and most have a subtle sheen and the pattern is stitched with a matte thread to create a truly stunning effect as it picks up different lights. They also offer some striped jacquard materials, too, which are very well made. There are tons of different color options, including purple, gold, red, ivory, brown, navy blue, royal blue, black, pink, green, hunter green, and virtually any other color you can think of! If you are looking to make a shirt, a skirt, a shawl, or any other type of apparel for a special occasion, any of the materials offered by The Fabric Exchange would work perfectly. All of their fabrics are sold by the yard and cut to order, and each one measures 60 inches wide, too. Based on the reviews that we read, most of the people who have used any of the materials, by The Fabric Exchange were very pleased. Final Verdict: All of the jacquard fabrics that are offered by The Fabric Exchange are beautifully made and feature truly stunning designs. There are tons of colors to choose from, too, and all are sold by the yard, cut to order, and reasonably priced. 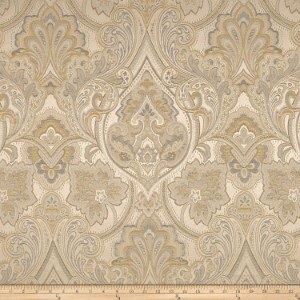 Last up on our list of the best jacquard fabric is a collection from Regal Fabrics. The materials that this manufacturer offers are certainly the most unique on our list. You’ll find animal prints, lattice and pine cone patterns, Southwestern-inspired designs, and even banana tree prints! If you are looking for a jacquard material that features a truly unique design, than Regal Fabrics is where you will find it! There are even fabrics that feature fish and moose, and landscapes, too! Talk about one-of-a-kind designs! All of the jacquard materials that Regal Fabrics are sold by the yard and cut to order; however, the width does vary from material to material. Additionally, the construction varies; some are made of 100 percent polyester, while others are made of a blend of cotton and polyester. The materials that this supplier offers can be turned into anything you can imagine; however, we think that they are very well suited for home décor pieces. For instance, you could pair their Southwest Gemma Jacquard with burlap or linen to make really unique window coverings for your home or a tapestry for a wall. If, however, you want to create an eye-catching skirt, shirt, jacket, or dress, you could certainly do that, too; just sewing pattern that you love and you’ll have a truly one-of-a-kind item in your wardrobe! According to the reviews that we read, the majority of the people who have purchased material from Regal Fabrics are very satisfied. Final Verdict: If you are looking for a truly one-of-a-kind jacquard fabric, look no further than Regal Fabrics! This manufacturer offers the most unique prints that will be sure to make a huge statement. Whether you are an expert sewer who knows your way around a sewing machine with your eyes closed or you are a novice that is just learning the ropes thanks to sewing help guides, there are a few sewing essentials that you are going to want to have on-hand, no matter what your experience level or what type of project you are making; obviously, fabric is one of those essentials. You can’t very well sew something if you don’t have fabric! There are tons of different fabric options to choose from, including denim and chambray, felt, and even faux leather and faux fur. While all of these materials have definite benefits, there’s one fabric that you are going to want to work with at some point, and that’s jacquard. What is jacquard fabric? What is jacquard fabric made of? What are the properties of jacquard fabric? In this section of our review, you’ll find the answers to these questions so you can really understand and appreciate this versatile and much-loved sewing material. Jacquard fabric is a type of material that features a pattern that is woven directly into the fabric instead of printed or dyed on the surface. Since the design is woven into the material, you can see the print on both sides, which is one of the reasons why jacquard is so versatile and very much loved by. Jacquard is made on a specially made mechanical loom, which was invented by Jospeh-Marie Jacquard (hence the name), a French weaver, in 1804. Believe it or not, this loom is considered one of the most advanced pieces of technology ever made! Interesting, right? What is Jacquard Fabric Made Of? Jacquard fabric can be made of a variety of different types of fibers. You’ll find that a lot of the jacquards out there are constructed of 100 percent polyester, which makes them very durable and easy to care for. However, there are also jacquards that are made of blends, such as cotton and polyester or lycra and polyester, as well as satin and even chenille. What are the Benefits of Jacquard Fabric? The primary reason why jacquard is such a beloved fabric is because of how it is weaved; the pattern, as mentioned, is weaved directly into the material, so you can see it on both sides. That’s not the case with materials that have printed or dyed patterns. Additionally, jacquard comes in a variety of designs, colors, and can be made of various types of materials. You’ll find lightweight jacquards, as well as heavy weight jacquards. Jacquard is definitely a must-have fabric that seamstresses of all abilities should work with at some point. Whether you’re making clothing, accessories, or home décor, jacquard will certainly suit your needs. All of the materials featured on this list are high-quality, well made, durable, and easy to work with. We have no doubt that you’ll be able to find a jacquard fabric that you’ll love!